The expedition Wrecking Crew aboard our J-Rig. Photos by David Lansing. Our expedition consists of nine peeps (a “peep” being river lingo for people like myself who go river rafting on organized adventures), a six-person Wrecking Crew (the support staff), two yellow inflatable neoprene boats with oaring frames in which the peeps travel, a pontoon boat with an outboard motor on the back, which Arlo calls the “J-rig,” carrying most of the crew as well as food supplies, and Arlo’s ducky—an inflatable kayak tied atop the pontoon boat. There is, as you can see, a unique vocabulary that comes with river rafting. For instance, the large metallic kitchen boxes that hold much of our food are called Sarah Jane’s World in recognition that nobody ever gets into them except our cook, Sarah Jane. The rope secured around the perimeter of the inflatables, used to grab on to when we run rough water, is called the chickie line (the Wrecking Crew never, ever uses the chickie line; only the peeps) and the plastic wash buckets used to do dishes and the like are called chickie pails (because they look like chicken feed buckets). We seldom see the J-Rig which acts as a sort of advance team for our little party. When, for instance, we pulled onto a rocky sandbar this afternoon and made our way through a dense thicket of tamarisk to a hollowed-out indentation in the limestone cliffs known as Tex’s Grotto, our lunch—sliced ham, turkey, cheese, tomato, lettuce and two different types of bread, along with fresh fruit, chips, cold drinks, and chocolate chip cookies for dessert—was neatly arranged on a cloth-covered portable aluminum table, thanks to Sarah Jane and the other crew members who had arrived here an hour earlier. Stashing the book in his backpack, Arlo says, “River running makes everything taste good.” He’s right. Never before have I contemplated the complex flavors of a chocolate chip cookie washed down with a cold beer. 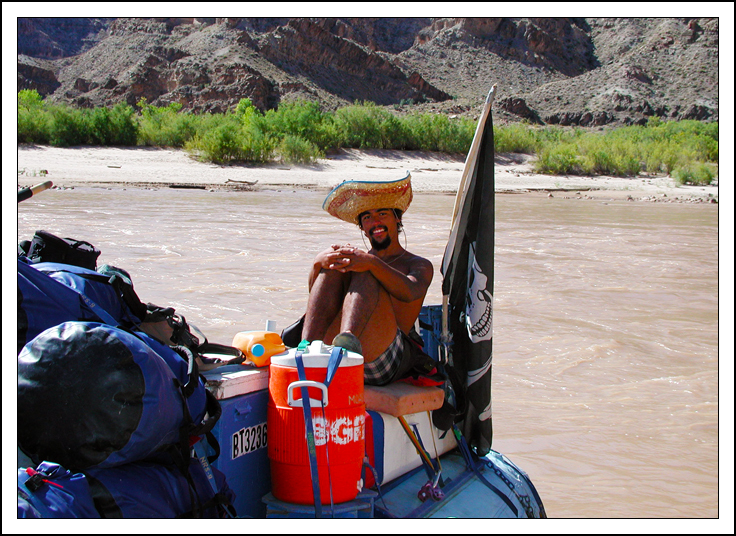 Our expedition leader, Arlo, aboard his pirate boat, Paradise Lost. Photo by David Lansing. A belligerent sun smirks overhead as we drift like water skippers atop a soupy chocolate-colored river not far from where we put in at the Potash boat ramp early this morning. 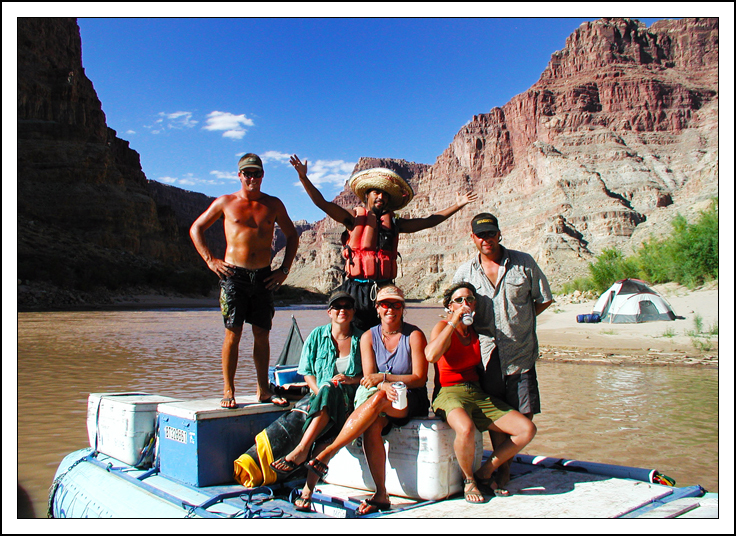 It is day one of our excursion down the Colorado, what our guide, Arlo, calls simply The River. 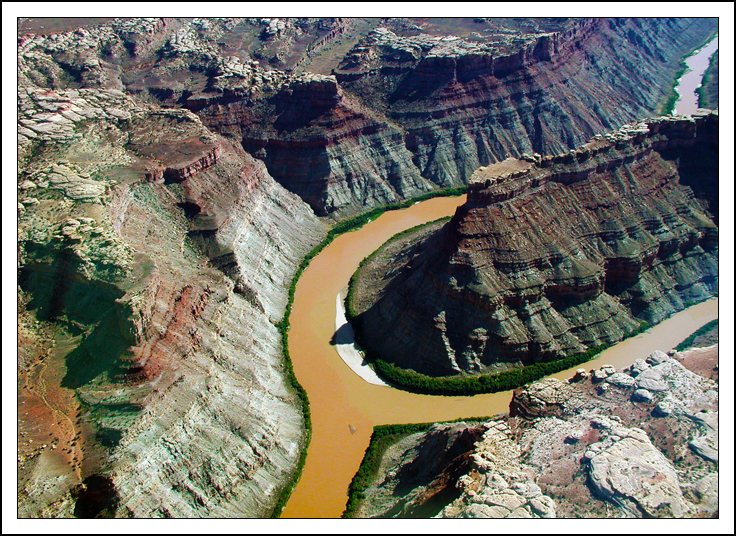 The carrot at the end of our liquid stick—the hellacious rapids of Cataract Canyon—are 45 miles downstream. I have to say that my initial impression is disappointing. This isn’t what I was expecting. When I first contemplated running the river, I imagined an extended roller coaster ride; several days of lurching, gut-wrenching rapids culminating in Cataract Canyon, so named by Major John Wesley Powell because “the declivity within is so great and the water descends with such tremendous velocity and continuity that (Powell) thought the term rapid failed to interpret the conditions,” according to the diary of expedition member Frederick Dellenbaugh. 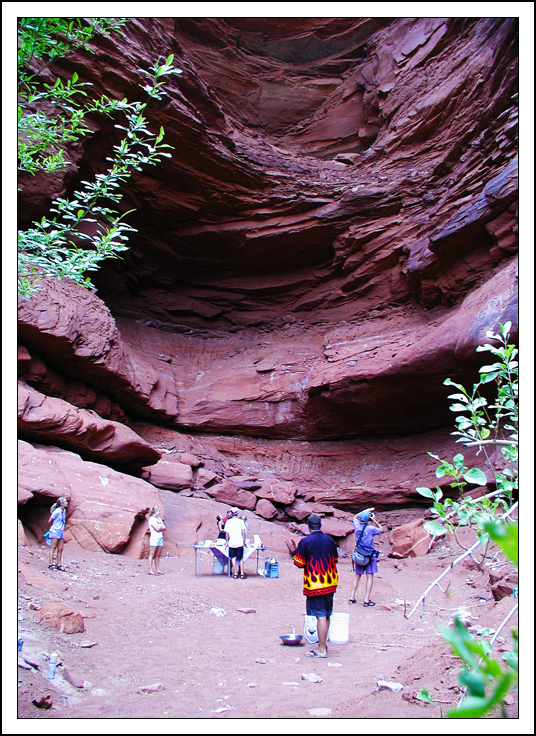 Instead, our journey down Meander Canyon is as desultory as a kiddie’s pony ride at the state fair, as turbulent as the water in an inflatable wading pool. To keep us from getting bored, Arlo tosses out crumbs of geological factoids, chumming for our interest. But none of us are biting. Each one of his fascinating details about the surrounding cliffs (“Those slab-topped pinnacles are white rim sandstone of Permian age”) is met with indifferent silence. It is too hot, too still. We sip water. We spread Blistex over our lips for the millionth time. We ask each other—again—if we would like a stick of gum, some dried apricots. After a couple of hours, I ask Arlo if I can get out of our inflatable and float beside the boat. Sure, absolutely, says Arlo who, with his upturned sombrero and Pancho Villa mustache and goatee, looks like a Mexican pirate (he’s also flying a pirate flag on our inflatable which is ironically nicknamed “Paradise Lost”). So I pull on a faded-orange life-vest and fall off the back of the boat into the water. I float on my back, like a log. Drifting aimlessly down the river which is cool and refreshing. I close my eyes. It is so quiet and peaceful in the water that it is easy to imagine falling asleep. While floating. And it doesn’t seem such a bad idea. So yesterday I was talking about David Hoskins of Heron’s Flight Winery and his Italian wines as well as their restaurant with its Italian-Korean-Indian influences. I also suggested—not at all in a derogative way—that Mr. Hoskins, whose original background was as a chemist philosopher (or, perhaps, philosopher chemist) was a bit eccentric. But I forgot to mention one other Heron’s Flight oddity and that is Mr. Hoskins ratafia, which he both serves in the restaurant and sells at the winery. The first time I sampled ratafia, which is a homemade infused liqueur, usually made with brandy but also vodka and wine, was five or six years ago on the island of Ile de Re off the west coast of France. It was made by a very charming man named Eric Nicolai who owned a hotel and bar called Le Vieux Gréement. 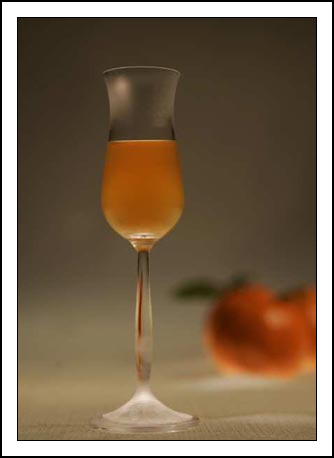 As I recall, Eric made his ratafia with an island cognac, oranges, cloves, cardamon, and sugar. It tasted vaguely of Grand Marnier—but fresher and livelier. I have also had Spanish versions of ratafia, made with a combination of red wine and vodka as well as citrus, cinnamon, and other spices that, to me, seemed more like fortified sangria. Anyway, David Hoskins makes a house ratafia at Heron’s Flight using what he says is “a traditional 18th century recipe” with quinces. Supposedly ratafia got started around the 18th century in France when this homemade elixir was imbibed when ratifying treaties and the like and, indeed, the most common was a quince ratafia. My guess is that David borrowed his recipe from Jane Grigson’s Good Things, a fascinating cookbook that explains what to do with kippers or pigeons and how to bake meat pies or salt venison. Towards the back of the book, she explains how to make fruit liqueurs and ratafias, including an old-fashioned recipe for quince ratafia in which you basically take two large quinces, grate them, stuff into a quart jar, add some sugar, cinnamon, ginger, and mace, and then fill the bottle with brandy or vodka. Leave in a cool, dark place for about a month and you’ve got quince ratafia, just like what David Hoskins sells for $39 for about 8 ounces. 1. Rinse the fruit and separate the peels from the fruit, reserving the peels. Squeeze the juice. 2. Remove the white pith from the zest of about 12 tangerines. Cut the zest into strips until you have about 2 cups. 3. Combine the brandy, juice, zest and simple syrup in a large resealable jar. Toast the clove slightly in a pan over medium heat, just until fragrant, and add it to the brandy mixture. Crush the cardamom pod with a mortar and pestle and add it to the mixture. Seal the jar, shake it, and store in a dark place for at least 1 month, shaking every day or so. After a month, strain the zest and spices from the liquid and discard. Let the remaining solids collect on the bottom of the jar. Pour off the liquid and discard the solids. Refrigerate to preserve the acidity. David Hoskins pours his Sangiovese at Heron's Flight. Photos by David Lansing. “Should have been here Sunday,” said David Hoskins as he poured me a touch of Sangiovese, an unusual varietal to find in the middle of New Zealand’s North Island. “Why, what was Sunday?” I said, swirling the jammy wine in my glass. Back in the States, Sunday was Father’s Day but here in New Zealand that’s celebrated on the first Sunday of September, so I knew it wasn’t that. 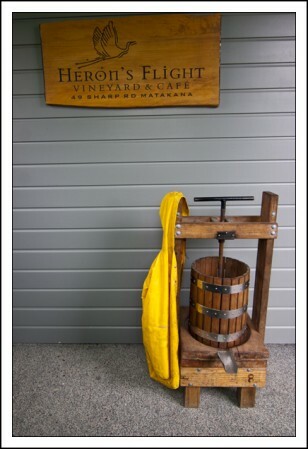 “Sunday was Fill Your Own Bottle Day,” said David who is the proprietor of Heron’s Flight, the only vineyard in New Zealand specializing solely in Italian grapes. David explained to me that just for fun he’d started this event three years ago where you can bring your own bottle and he’ll fill it with a blend of his Dolcetto and Sangiovese wines for $9.99 (plus an extra buck if you want a cork), which is quite a bargain when you realize that his 2005 Sangiovese, which is what he was pouring me, goes for $50 a bottle and the Dolcetto is $39. 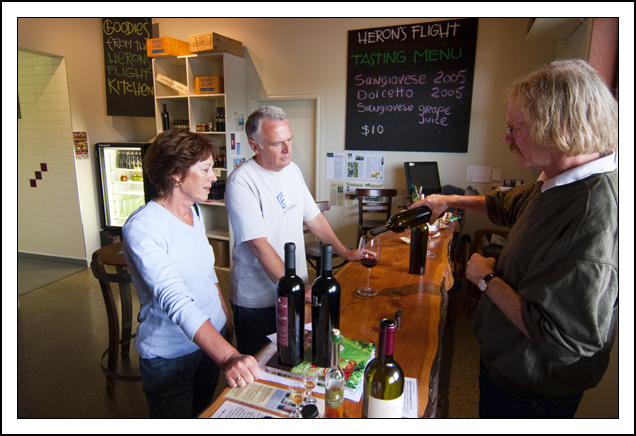 David and his wife, Mary Evans, planted the first vines at Heron’s Flight in 1987 (David says that before he started the winery he was “a chemist philosopher, which is perfect training for being a winemaker since you need to know a little chemistry to make wine and then you have to be philosophical about how it’s all going to turn out”). Like a lot of the winemakers and entrepreneurs I’ve met in New Zealand, David and Mary are, I think they’d agree, eccentrics. David was actually raised in Pennsylvania and went to school in Virginia (where he did, indeed, major in Philosophy and Chemistry). After graduating, he decided to go see a bit of the world, as young people often do, but only made it as far as New Zealand where he met Mary, an English teacher, who was from London. So the philosopher/chemist from Pennsylvania travels to New Zealand to meet an English teacher from London and together the two of them decide to start a winery in Matakana where they will make nothing but Italian wines. But there’s one other interesting thing about David Hoskins and Mary Evans and that is this: A few months ago they entered into a partnership with Clyde and Farida Cooper. The Coopers are from India where they ran and owned a courier business before deciding to settle in Matakana. Now the Coopers own a small vineyard in Matakana that is planted in nothing but French varietals—cabernet franc, petit verdot, merlot. So now Heron’s Flight is not only going to be sampling and selling their Italian wines but the Cooper’s French wines as well. Just to make it more interesting: There is also a lovely restaurant at Heron’s Flight and, not too surprisingly, the menu was based on what you’d find at an Italian trattoria—good breads with marinated olives and a tapenade; homemade gnocchi; antipasto platters and various pasta dishes. But last year about this time, they brought on a new chef, a young woman of Korean decent who brought some Asian influences to the kitchen. And now that the Coopers are business partners, the restaurant has also started to introduce Indian and Persian dishes to the menu. So you’ve got your Italian/French wines to go with your pasta/curry/pulgogi. Like I said, winemakers can be an eccentric bunch.